Lasagna. One dish. One hour. Homemade. My friends, it can be done! This recipe has the classic flavors and cheesy layers of a traditional lasagna, but it will be on your table in much less time. For the noodles, you will want to use the traditional lasagna noodles, not the no-boil noodles. The noodles will cook in the juices of the tomatoes. 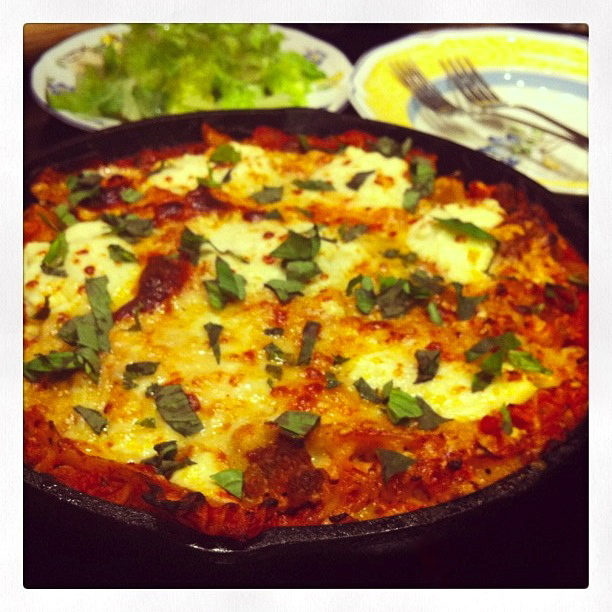 Overall, this did the trick for a lasagna craving. For a larger dinner party, going the "traditional route" with a Goliath, Jr. would be the way to go, but for a quick weeknight dinner, this is one recipe to keep in your repertoire. Next time you a craving comfort food but don't have as much time to cook, give this skillet lasagna a try. PS: It tastes even better the next day! In the bowl of a food processor, pulse the tomatoes with juices so that the tomatoes are coarsely chopped. In a large cast iron skillet, heat the olive oil over medium heat. Add the onion, salt, and pepper to the pan and cook, stirring occasionally, for 5-7 minutes. Mix in the garlic, red pepper flakes, Italian seasoning, and cook until fragrant for about 30 seconds. Next, add the Italian sausage to the pan and cook until no longer pink. Scatter the broken lasagna noodles all over the pan, and pour the tomatoes with juices over the top. Increase the heat to medium-high and cover. Stir often until the lasagna noodles become tender, about 20-25 minutes. Preheat the broiler to high. Once the pasta is al dente, remove the skillet from the heat. Mix in half of the mozzarella and Parmesan cheeses, along with 1/4 cup of the ricotta. Dot the remaining ricotta over the top, and then evenly sprinkle with the remaining mozzarella and Parmesan cheeses. Transfer to the oven. Broil for about five minutes or until the cheese bubbles and becomes golden. Remove from the oven, garnish with basil, and serve. What a one-pot wonder. I love lasagna but it makes so much. I need to use this recipe and cut it down for a small pan. I know I can freeze it but I always end up cooking new stuff and tossing the freezer food away because it's old. :) This looks yum.